ABIN570913 (0.3µg/ml) staining of Human Kidney lysate (35µg protein in RIPA buffer). Detected by chemiluminescence. Specificité NP_005832.1 and NP_955359.1 represent varients of the same protein. Immunogène Peptide with sequence CPSRGQGKPS, from the C Terminus of the protein sequence according to NP_005832.1, NP_955359.1. 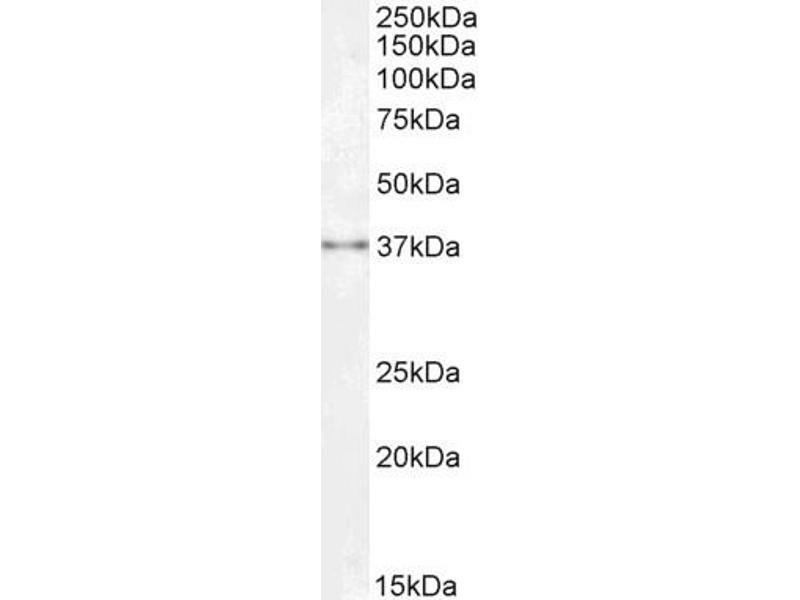 DS WB Results: Approx 37 kDa band observed in Human Kidney lysates (calculated MW of 35.1 kDa according to NP_005832.1 ). Recommended concentration: 0.3-1 μg/mL. Primary incubation 1 hour at room temperature. This.product has been successfully used in ERMS cells (PMID: 20068162). Recommended concentration: 1-3 μg/mL. 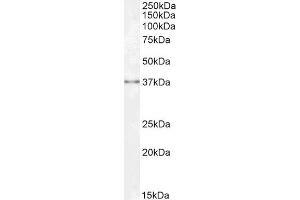 DS IHC Results: This product has been successfully used by customers in paraffin embedded Mouse Brain, showing nuclear staining. Recommended concentration: 1-3 μg/mL. Immunofluorescence: Strong expression of the protein seen in the cytoplasm and Golgi apparatus of HeLa and HepG2 cells. Recommended concentration: 10μg/ml.